Modesto, a city in central California with a population of approximately 212,000 people, operates a two-location wastewater treatment process that provides water clean enough to be used for irrigation or discharge into the San Joaquin River. Effluent from the Sutter Primary Treatment Facility, which handles an average of 20 million gal per day (mgd) of raw wastewater, is pumped six miles to the Jennings Secondary/Tertiary Treatment Plant, a recently redesigned and upgraded facility that includes anoxic and aerobic secondary treatment, membrane filtration and ultraviolet (UV) disinfection. The new Jennings facility handles about 12.6 mgd of treated wastewater and went online in the spring of 2016. In the new aeration blower building (ABB) and membrane blower building (MBB), noise reduction was specified to cope with the whine generated by the high-speed blower. Both buildings are constructed of concrete floors and walls, with steel deck ceilings. The ABB has dimensions of 49 ft wide by 93 ft long, with a ceiling height of 20 ft. The MBB is 49 ft wide by 73 ft long, with a ceiling height of 19 ft. Only half of each of the buildings is currently being used, as both are designed for 100% capacity increase. The ABB currently has six 300-hp Neuros turbo blowers operating at approximately 19,000 revolutions per minute (rpm), each moving 6,000 standard cu ft per minute (scfm) of air. 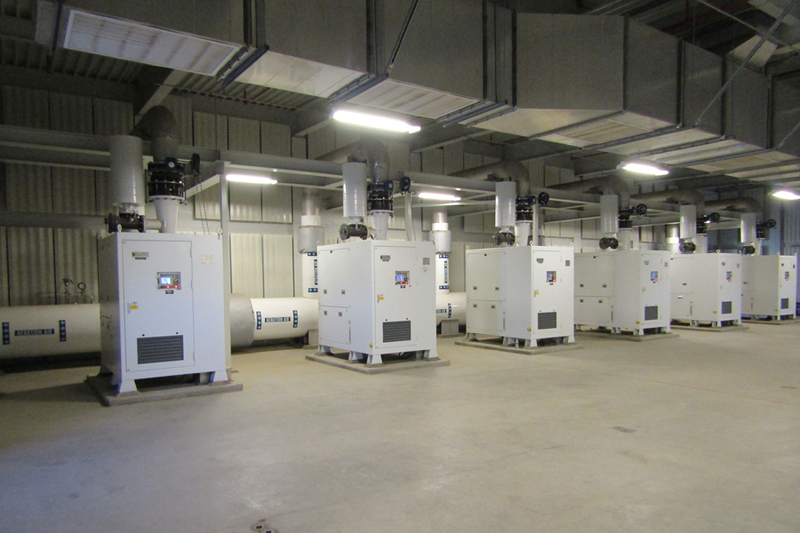 The MBB houses four 150-hp Neuros turbo blowers running at approximately 15,000 rpm and moving 3,800 scfm of air each. Although Neuros blowers are known in the blower industry for being quiet, there is still a need for noise control within the concrete building. High noise levels in industrial settings create an operational safety hazard by disrupting communications among plant personnel, as well as a personal health hazard by endangering those plant operators’ hearing. To reduce the dangers of excessive noise, Carollo Engineers Inc. of Walnut Creek, Calif., included noise remediation in the specs for the plant design. Eckel Noise Control Technologies was included as a preferred supplier in the design specs for supplying acoustic panels for noise remediation. Panels of different dimensions were specified to fit within existing utility and structural elements on the walls of the two buildings. The specs called for the use of Type IV, perforated, v-ridged aluminum Eckoustic functional panels. The panel complement in the ABB was 154 30-by-96-in. panels and three 30-by-48-in. panels. In the MBB, 109 30-by-96-in. panels, 15 30-by-72-in. panels and 14 30-by-48-in. panels were installed. Installation of Eckel acoustic panels is simple. They mount with four supplied type-316 stainless steel mounting brackets. James Long Construction Services of Sacramento, Calif., performed installation. According to Aaron Trott, plant maintenance superintendent, the panels have done their job. Eckel acoustic panels are used in noise reduction applications ranging from industrial plants to office complexes to athletic facilities and are available in a range of sizes up to 10 ft long and 30 in. wide. They can be fabricated from aluminum, galvanized steel or stainless steel. Both flat-surface and v-ridged panels are available.